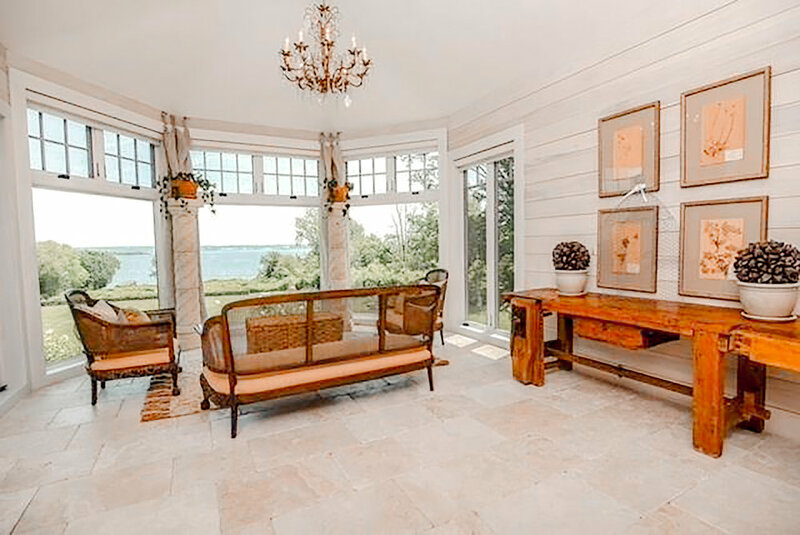 Built in 1875, this gorgeous, historic home truly stands out from the rest in Jamestown, Rhode Island. Just from seeing the exterior, we instantly knew this would be a special piece to write about. After reading and seeing the photos, it will leave you feeling as though you have traveled across the Atlantic and stepped straight into the Mediterranean coast. Every inch of the home is drawn from European influence, from the emphasis on natural and raw finishes to the warm and earthy color palette. Like European culture, this home offers multiple opportunities for outdoor living or at least a connection to the outside no matter which space of the home you are in. Though it is architecturally inspired by the architecture of Spain, France, and Italy, a New England aesthetic is also evident through the bay windows and minimalistic design style. It combines the deep-toned color palette with a mostly white canvas to provide a light and breezy vibe. Say good-bye to the traditionally shingled New England homes and say hello to this stone enveloping exterior. It seems there is one wing of the house that does have wood siding, as well as the stucco corridor connecting the two, but for the most part the material that catches the eye when seeing the facade is the use of stacked stone. That, along with the landscaping of the central courtyard, frames the picture perfectly of what you will be getting on the inside: a European villa with so much charm and emphasis on natural inspiration. A common characteristic among French country and Spanish influence interior design is the rich color palette. The use of warm, earthy colors such as reds, yellows, burnt orange, and taupe provide a nice consistency throughout the home. It is done tastefully through use of accents which compliment the cream and beige palette making the space feel airy and not as heavy. These deep-toned accents, as seen in the living room with the oversized area rug drawing attention to the fireplace as a focal point or in the kitchen with the decorative tile countertop and touches of red in the furnishing. 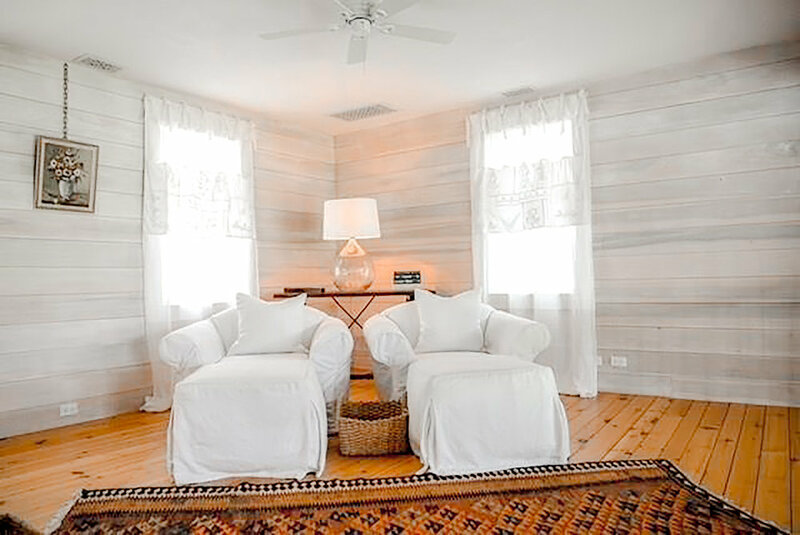 Another European trait to point out is the continuous use of natural materials throughout the home. 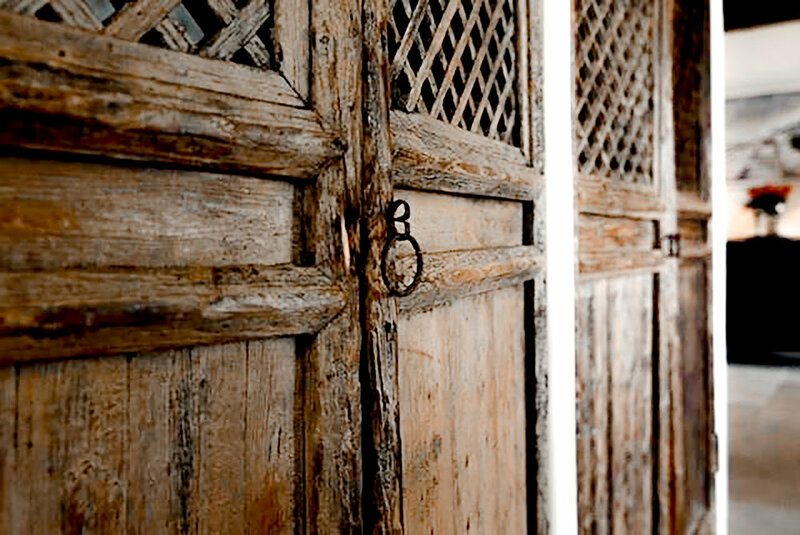 The raw, weathered wood, the stucco textured or wood paneled walls, the natural stone flooring…all of these design decisions were clearly drawn from wanting a natural aesthetic which is common in European design. Given that this home was built in the 1800s, you must assume there will be an abundance of character within it…and there certainly is! The incorporation of wood and iron elements fill the home with a rustic charm, combining the farmhouse and industrial design traits. 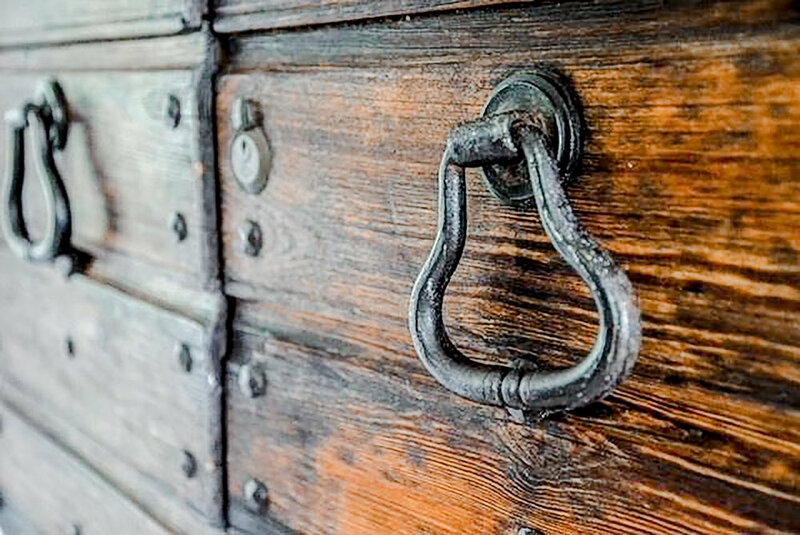 You can see it in the wooden doors and beams and even in the details of knobs and lighting, such as the candle holders (another common European interior characteristic). 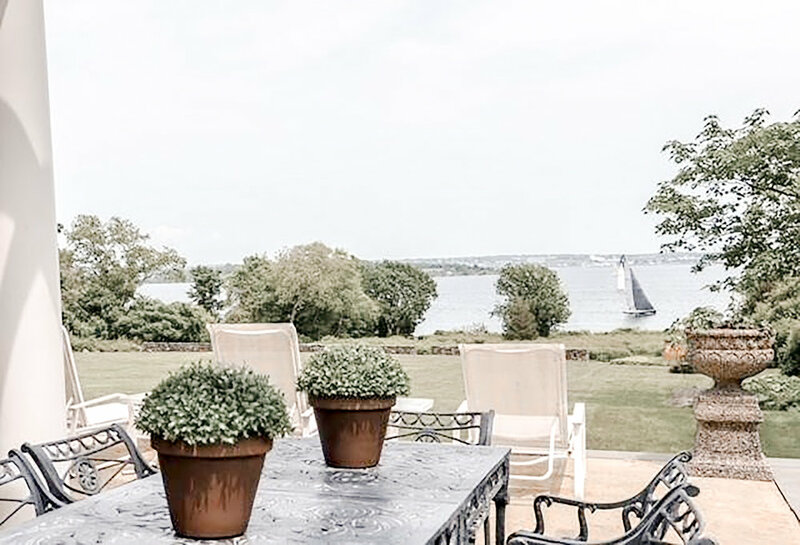 A pivotal element that European homes, and also New England homes, tend to have is the connection to the outdoors. 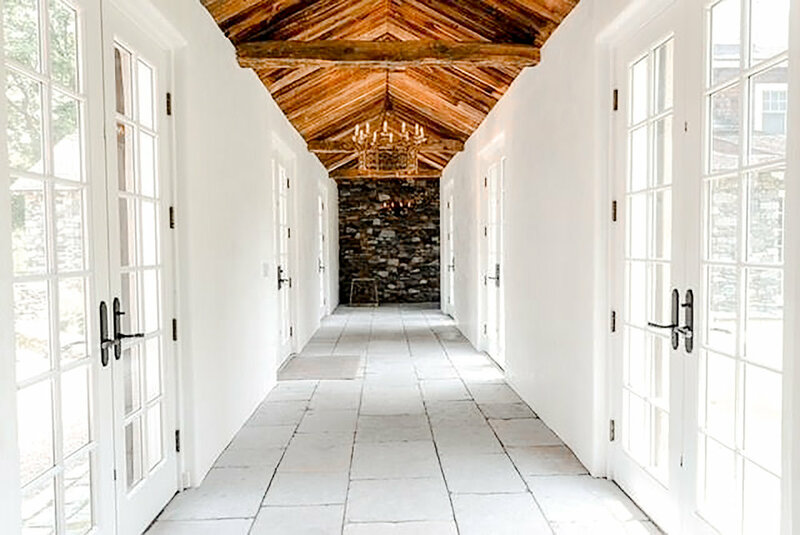 There can be literal connections, through use of windows and French doors or emulating it through its design and architectural details. This home provides you with both. With a beautiful waterfront landscape, the home should really always aim in leading you outside and it definitely accomplishes that. The interior spaces are practical and clutter-free [though still filled with character and charm] reflecting the peaceful atmosphere one gets when embracing the outside. In addition to the interior style, the home also visually guides you from the dining room or sitting areas or veranda directly to the outdoors. And why wouldn’t you want to be led that way with a view like that! If you'd like to learn more about this home, please contact Nicole Hoffman at Bessett Real Estate. For any interior design and renovation services, please contact Ally Maloney.